Even the most prepared travelers can experience an unforeseen event which calls for emergency funds. Your wallet might be stolen, for example. If you are not prepared and have not included emergency funds in your budget, you would not have thought to have that extra cash or extra credit card stashed away. Besides not having any money immediately available if you have lost your wallet, there are other instances which would call for unanticipated expenses. You may have an emergency which calls for an expensive airfare home. If you have a medical emergency, some hospitals might require that you pay cash upfront … what do you do? Losing a wallet or money or being hit with an emergency which calls for funds you did not anticipate needing can be a traumatic affair. To make things worse, you are in a foreign country and so have no family or familiar resource that you can turn to. There are some things you can do to prevent a bad situation becoming worse. Keep some foreign currency cash – at least $500 – and transfer it from your carry-on luggage to a safe immediately you reach you destination. There are safes in most residences, hostels and hotels, or inquire about a safe at your local bank. Or, better still, keep a credit card with that amount available locked away. If your wallet has been stolen, report any credit or debit cards that have gone missing. Your family might be able to send you emergency funds quickly through wire transfer, Western Union or online funds transfer services such as Xoom which transfers money internationally within minutes. But, make your life easier and try to bring those emergency funds with you at the start of your time studying abroad. Being prepared is always the best approach! 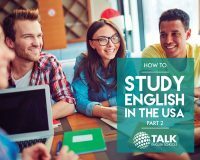 Download now to get your e-Guide How to Study English in the USA and learn more about wise budget and money practices while studying abroad.